The award, given to the PR department that consistently strives for excellence in its dealings and relationships with the media, has been presented to one NFL club since 1990. The Vikings’ public relations staff was honored as the NFL’s best on Monday, when the Pro Football Writers of America named it the winner of the 2018 Pete Rozelle Award. The award, given to the PR department that consistently strives for excellence in its dealings and relationships with the media, has been presented annually to one NFL club since 1990. 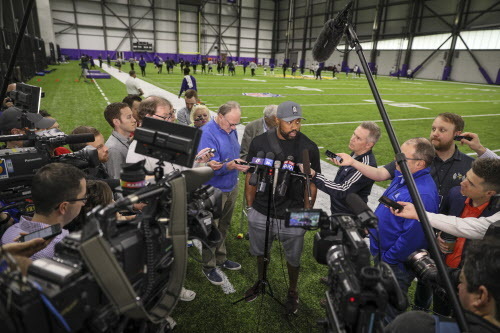 This is the first time the Vikings’ PR staff — of Bob Hagan, Jeff Anderson, Tom West, Jon Ekstrom and Sam Newton, as well as interns Carly Bonk, Danielle Burns and Walt Scher — has won the award. The Vikings are the 15th different team to win the award in its 29-year history, beating out PR staffs from the Bills, Broncos, Rams and Dolphins. They are the first NFC team to win the award since the Cardinals in 2009. The award is named for Rozelle, the former NFL commissioner who broke into the league as the Rams’ PR director from 1952-55, and used his relationships with the media to foster growth in the league through the AFL-NFL merger, the inception of the Super Bowl and more.